MEXICO CITY — His mother was grievously ill, nearing death. So Jesús Vicuña, 17, made a deal with the heavens. In his prayers for her recovery, he vowed to make a certain painful sacrifice in exchange. Which is how he found himself the other day walking on his knees, under the weight of a heavy backpack, along a crowded sidewalk in Mexico City. He winced with each step, and every few paces he fell onto his arms with a groan, seeking a moment of relief that never came. 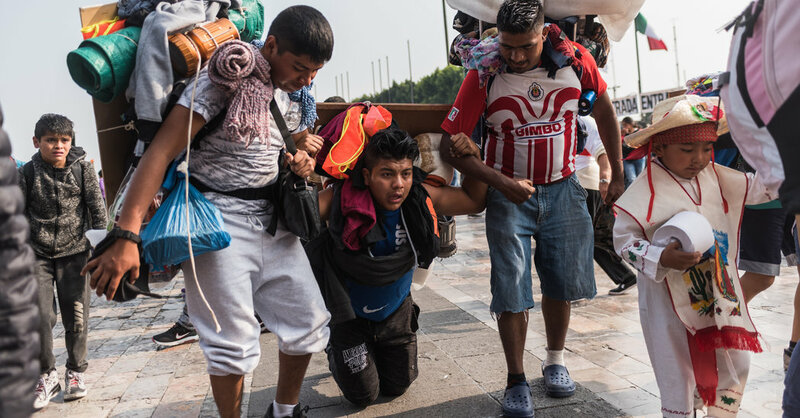 But more than 20 blocks after he began this ordeal — the last stage of a three-day journey — he knee-shuffled the last few yards into the New Basilica of Guadalupe, Mexico’s most important shrine, and collapsed face down on the cool stone floor, gasping for air. Mr. Vicuña had reached his goal. “It was a promise,” he said, a little delirious from emotion and fatigue. Mr. Vicuña’s trial came as part of an enormous annual pilgrimage to honor the Virgin of Guadalupe. Over the course of several days this month, an estimated nine million people visited the basilica, with some seven million of them filing through the building between Tuesday and Wednesday, to celebrate what believers say was the appearance of the Virgin Mary before an indigenous Mexican peasant named Juan Diego in 1531. It is hard to overstate the singular importance of the Virgin of Guadalupe to the Mexican identity. She serves as a binding force that transcends the country’s varied and dramatic sociodemographic divisions, and her image is ubiquitous — in portraits hanging on the walls of homes; in small shrines found in shops, gas stations and parking lots; and on objects as varied as kitchenware, jewelry, lamps, satchels, refrigerator magnets and bottle openers. And even as Latin Americans have defected in enormous numbers from Catholicism to evangelical congregations, the deep devotion to the Virgin of Guadalupe, also known as Our Lady of Guadalupe, has helped to slow this tendency in Mexico and throughout the Mexican migrant diaspora. There is no greater expression of this devotion than the annual pilgrimage to the basilica, which culminates in a series of Masses and celebrations on Dec. 12, the date on which the Virgin is said to have made the last of several appearances to Juan Diego. To reach the basilica, many trekked on foot from their homes across Mexico, some traveling many days. Others arrived by bicycle, like the 60 or so from the Guadalupe Cyclists Group of the state of Morelos, all wearing matching orange vests. The pilgrims came bearing treasured objects from their homes — portraits, statuettes and wall hangings of the Virgin — which they held aloft as they entered the crowded basilica, as if recharging the items’ potency like a solar battery. They aimed their objects toward a framed image hanging on a wall behind the chancel. It is said to be the agave-fiber cloak of Juan Diego, on which the Virgin imprinted her likeness during their final encounter. Most headed straight for a narrow passageway beneath the chancel where an opening allows worshipers a view of the framed image above. Volunteers and basilica employees briskly herded the pilgrims onto four parallel conveyor belts, ensuring that nobody lingered beneath the image. Outside, thousands of pilgrims pitched tents in the vast plaza and on nearby sidewalks, or fashioned makeshift shelters out of blankets, turning the basilica complex and the surrounding blocks, which had been closed off to vehicles, into a kind of informal campground. The mood was at once reverential and celebratory, fueled by musical ensembles and indigenous dance groups. “We’re so thankful to have gotten here,” Orlando Munive, 35, said on Tuesday afternoon while standing at the gates of the basilica complex, which is commonly known as the Basilica of Guadalupe. He and a group of relatives had walked three days from their homes in the state of Puebla on a route that required them to hike over the Popocatépetl volcano. A portrait of the Virgin, usually hanging on the wall of his house, was lashed to his backpack with string. Many of those who hiked — or crawled — to the basilica were compelled by a pact they had made with the Virgin. Jorge Iván Díaz Soto, 28, a nurse, said he had done the two-day trek from his home in the State of Mexico, bordering Mexico City, ever since his son was born three years ago. When his wife was pregnant, her doctors determined that she and the fetus had incompatible blood types and “didn’t give the baby any hope of living,” Mr. Diaz recalled. So, the couple prayed for “a miracle,” he said, and made a promise that if their child survived, they would do the pilgrimage on foot. Their son was born healthy. The couple had made the trip this year with their son and several other family members, arriving Tuesday afternoon, and had laid out some blankets on a walkway beneath a tree on the basilica complex. They planned to stay up for the midnight Mass and spend the night under the open sky before heading home on Wednesday. “In thanks” to the Virgin, he explained. By late Tuesday night, the vast plaza in front of the basilica was jammed with many tens of thousands of people waiting for their chance to file beneath the portrait of the Virgin inside. Hundreds of thousands had already paid their respects and moved on, and many thousands more were approaching in a dense river of humanity along the principal boulevard that leads to the basilica’s gates. At midnight, the main Mass celebrating the Virgin’s appearance began, and the plaza and the surrounding neighborhood lifted with the sound of pilgrims singing Las Mañanitas, a traditional Mexican birthday song. Adherents consider Dec. 12, when the Virgin is said to have imprinted herself on Juan Diego’s cloak, as her birthday. And still they came through the night and into the following day, thousands upon thousands carrying their artifacts of devotion, the conveyor belts churning away without stop.